Writing short stories for a large commercial market is all but lost to today’s authors. But half a century ago magazines of all descriptions and shapes and sizes formed an important part of American culture, and the fiction pieces in them provided entertainment much as televised dramas do today. This marketplace in the 1930s provided an opportunity for a budding author like Wayne D. Overholser to try out and perfect his skills as a writer, a place to make a private dream come true. The youngest of four children, Wayne was born on September 4, 1906, in Pomeroy, Washington, to pioneer parents. He was raised on two different farms in the Willamette Valley of western Oregon, and most of his early schooling occurred in a one-room schoolhouse called Scrabblehill. The teacher boarded on the Overholser farm, and Wane often walked the mile and a half distance at her side. In the evenings by the lights of a kerosene lamp he read his school assignments, practiced penmanship, and drew pictures with colored pencils. Although Wayne performed all the chores expected of a farm boy of that day, raising crops and tending animals for a livelihood was not for him. Born left-handed and nearsighted, he was not in the least mechanically inclined, a source of consternation to his father who could not understand why everything from harness buckles to threaded nuts and bolts looked backwards to the boy. Wayne’s interests were more creative and adventuresome, at least in a vicarious way. As a youngster he gave serious consideration to becoming a clown in the traveling circus. he read a great deal, devouring such books as Scottish Chiefs, Ivanhoe, Lamb’s Shakespeare Tales, and the King Arthur tales and many of the Greek myths. He also read the thick, leatherbound Ridpath History of the World volumes that his parents had purchased by subscription. As Wayne grew older he drew cartoons and began writing poems and adventure stories. He liked stories of the West and read serials in copies of Country Gentleman that he borrowed from a neighbor. He also read the novels of Zane Grey; for him the high point of a Saturday shopping trip to the town of Eugene was the movie matinee where he watched silent films such as Grey’s Man of the Forest. In high school Wayne was keenly interested in politics and social issues and enjoyed debate. At home he found himself disagreeing on the issues of the day with his father, a staunch, unquestioning Republican. Wayne was breaking away from the stern views of his parents, fundamentalists Christians who believed that the infidels who drank, swore, danced, played cards, or practiced other faiths were bound for the fires of hell. The move to the second farm had proved to be ill-advised, and the Overholser family was experiencing hard times when Wayne graduated from Pleasant Hill High School. Years earlier they had paid for his brother Roy’s college education, but in 1924 the family was in no position to make a similar offer to Wayne. Wayne’s grades had been excellent, almost straight A, and he was valedictorian in a graduating class of four students. Fortunately he was awarded a one-year scholarship to Albany College. The next year he attended Oregon Normal School, financed through part-time jobs and money borrowed from the school. He graduated with a certificate to teach. During his schooling he never considered a profession other than teaching. For one thing he could not afford more education; for another, he simply knew of no other line of work that he could do. No job offers came his way that summer of 1926. He tried selling books door to door for a time, but did not do well at it. He traveled out to Garibaldi where he worked in a sawmill for a few weeks. Then he went on impulse to a fortune teller who read his palm and solemnly advised him that if he went home a job would come to him. In truth Wayne had no other choice. He did return to the farm, hoping one of his resume’s had brought a favorable reply. None had, but he had been home only a short time when a call came offering him a job teaching a seventh-grade class in Tillamook. He eagerly accepted, and in the fall traveled out to the fishing and sawmill town on the coast, where he began a teaching career that was to last nineteen years. As a teacher, Wayne attended summer school six out of seven years from 1927 to 1934, when he received a Bachelor of Science degree from the University of Oregon. So much schooling, along with his philosophical turn of mind, earned him the nickname of “Prof” from his students. At a botany class during one of the summers he met a pretty student named Evaleth Miller, daughter of a registered nurse in Portland. They dated, and after Wayne returned to Tillamook they corresponded. In November of 1934 Wayne asked for her hand in marriage. Evaleth accepted, but her mother vigorously objected. Divorced, she wanted her eldest daughter to stay home so they could make a life together. Instead the couple eloped to Yakima, Washington. Wayne spent much of his spare time writing poems and stories, having a vague idea that someday he might sell one to a magazine. He wrote mysteries, fantasy and love stories, and westerns, and he attended monthly meetings of a local creative-writing group where would-be writers shared readings and criticisms. He also subscribed to Writers Digest and every month he read how-to articles and pored over the market guide in each issue. And while in pursuit of his degree he’d signed up for as many creative writing classes as his schedule permitted. By the time of his marriage, Wayne was writing regularly and had sent out a few of his stories to magazines, receiving printed rejections for his trouble. He did not entertain serious thoughts of a writing career, but he sensed that if he kept working at it he would sell a story someday. In the summer of 1935 Wayne and Evaleth drove to Missoula, Montana, where writing courses were being taught by E. Douglas Branch and Robert Penn Warren. In the classroom Wayne felt the most rapport with Branch, who unlike Warren encouraged his students to write for current markets. The trip to Montana strained the young couple’s finances, and often they ate meals of sandwiches and soup heated on a hot plate. But Wayne was much encouraged and returned to Tillamook more determined than ever to continue writing fiction. Through the school year he spent many evenings in an unheated upstairs room working at his typewriter, but his sole reward was a growing stack of unsold short stories—and a lonely wife. But Evaleth was a woman of great patience. Then, as throughout their marriage, whenever Wayne’s determination faltered Evaleth urged him to continue. He did continue, but not until the fall of the next years did the moment arrive that is most memorable in the career of a writer. Instead of the usual returned manuscript Wayne found a business envelope in his mailbox containing a check for fifteen dollars. One of his stories had sold to Popular Western, a pulp magazine edited by Leo Margulies in New York. The story was to be published in the December, 1936 issue. Wayne sold a second story that year, and then in 1937 he sold four more. His total income from writing in those two years was $127.57. These sales came slowly, and while the money supplemented a teaching income of less than $1600 a year, Wayne still had no more than a vague dream of earning a living by writing stories for the magazines. 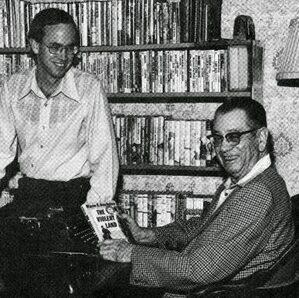 With those words began the professional relationship between Wayne and the literary agent he came to know as “Gus.” This association lasted more than four decades and saw the sale of over 400 short stories and novelettes in pulp magazines and 100 full-length novels published in hardcover and paperback editions. Results of Lenniger’s work in the marketplace were soon apparent. In 1938 Wayne’s writing income shot up to $344.00. In the summer of 1939 he and Evaleth drove to Los Angeles where “Prof” had signed up for six weeks of graduate work at the University of Southern California. Now they traveled with a two-year-old son, and expenses for the three of them were much higher than anticipated. After three weeks their money was almost gone and they were faced with the prospect of having to pack up and go home. But then in mail forwarded from Tillamook came two checks from Gus, enough money to allow Wayne to finish the term. His earnings that year totaled $472.65. And in 1940 the dream seemed even larger when he cleared $614.20. As his confidence grew, Wayne’s literary output increased, too. So did his sales. A memorable year for him was 1942 when his earnings from writing totaled $1704.62, a sum that exceeded his annual salary as a teacher. He began to think more seriously of a career change. Having taught in Tillamook for sixteen years, he began to feel that he had gone stale. In addition to teaching social studies, he had coached basketball and had sponsored a chess club. He was ready for new challenges, but not quite ready to give up a regular paycheck and support his family solely by writing stories. In the spring of 1942 Wayne applied for a teaching position at the high school in Bend, a small, picturesque town in the middle of Oregon where the Cascade Mountains face out toward a great stretch of high plains known locally as the Oregon Desert. He got the job and moved to Bend the following summer. In many ways living in Bend gave Wayne a new outlook on life. He wrote more stories than ever, and he began work on a western novel. In 1943 and 1944 his earnings from writing totaled over $3,000. And in 1945 alone he made $3,162.82. and his first novel was published by Macmillan under the title, Buckaroo’s Code. The decision that proved a major turning point in Wayne’s life came in the spring of 1945. Now father of two sons, he decided not to return to his teaching position in the fall. He wanted to write full-time and believed he could substantially increase his income if he devoted all of his energies to the typewriter. While the decision did not come easily and involved a great deal of discussion and soul-searching with Evaleth, it was one that neither ever regretted. Wayne’s earnings soon reflected the change. In his first year away from the classroom, he sold forty stories and made $4,383.72. His salary during his last year of teaching in Bend was $2,300. The writing career of Wayne D. Overholser was established. Through the next several years he wrote more than half a million words per year, paid at a rate from half a cent to a cent and a half per word. During that time he moved to Colorado where his third son was born, and he shifted his literary production away from the magazines to books. He accurately foresaw the demise of the pulp magazines and by 1950 knew that if he was to sustain a writing career he would have to create 60,000 word novels. This was a transition he made successfully while other authors who had been well known in the pulps fell by the wayside. These writers were either unable to create full-length novels, or had become so mired in the cliches of dialect and plot situations common to the pulps that they were unable to make the change. In addition, some of these authors were growing old and found it difficult to adapt their skills to new markets. A partial explanation for Wayne’s later success in the writing business is that he conducted a great deal of research into the history of the West, and as much as possible—given the speed with which he turned out short stories, sometimes as often as one finished story every two days—he gave his stories historical backgrounds or at least imbued them with historical realities. This approach would serve him well in later years. But perhaps more important to his success in the highly competitive book market was the fact that he envisioned his stories thorough the eyes and through the emotions of the characters he created. this reversed the method of many other prominent pulp magazine authors, who imposed a few plot situations on all of their stories. While the technique may have made for consistent action-story formulas that guaranteed sales, it also lead to shallow characterizations that could not carry a story for 60,000 words. While Wayne wrote stories in other genres early in his career, he naturally gravitated to westerns. This was partly due to the encouragement of August Lenniger, but to a larger degree it was a reflection of his background and interests. His boyhood reading had steeped him in classic adventure stories. Elements of the King Arthur tales can be found in westerns, and certainly the traditional elements of all adventure literature are present in this uniquely American genre of fiction. Also, in his boyhood, Wayne witnessed firsthand a life very similar to that depicted in fictional accounts of the West—a life based on the seasons, a life dependent on animals for transportation and power, a life without electricity or running water. He remembered hearing his maternal grandfather tell of crossing the Great Plains to western Oregon in a covered wagon. He saw uniformed Civil War veterans in Fourth of July parades. These boyhood memories made pioneer times quite real to him. And in later years Wayne interviewed men and women who had lived through that period of American history made so famous in literature. Wayne great admired the work of Ernest Haycox, and believed that his short stories constituted some of the best fiction ever written about the West, better even than Haycox’s more famous novels. The writing of Ernest Haycox always had power, and he had the rare ability to portray the more subtle emotions of his characters, giving them a greater sense of reality. Wayne studied Haycox’s stories carefully and while he never consciously imitated that unique style, he was unquestionably influenced by this maser and was inspired to develop his own sense of characterization. Clearly, in the lines quoted above, Wayne has projected his own experiences into the character of Neil Hartley, drawing both on his backgrounds as a teacher and on his memories of attending a one-room school in rural Oregon. On another level of experience, Wayne as a storyteller is drawn to two sources of conflict. One is simply between opposing forces, Unionists and Secessionists, with the protagonist caught in the middle. The second concerns a deeper problem: applied book l’arnin’. One day the man who teaches lessons embodying concepts of honesty and integrity will have to take a stand and back up his moral values. That this teacher is not physically equipped to take such a stand adds to the drama and mounting suspense of the story. A gangling school teacher with flawed vision but a sure grasp of the fundamental issue at stake is a character drawn from Wayne's own background, and while this story is representative of pulp fiction published in the United States during the post-war years, it is at once vastly superior to most “Westerns.” This one rises above cliche, both in language and in plot situation, offering insights into the characters’ motivations while giving the reader an accurate historical background for the fictional events depicted in the narrative. Like other short stories in the western genre, “The Steadfast” is constructed round a male who is young and unmarried, faced with a seemingly impossible conflict. Through the course of the story he conquers evil and wins the girl. While this story is typical of other westerns, it, too is superior to the cliche because of the believable characterizations that give the story a certain complexity and depth that are found in the best of Wayne’s stories. In the beginning of his career in the 1930s Wayne’s goal was simply to sell the stories he wrote. He studied magazines that were potential markets for his work. Then he wrote stories that he hoped would appeal to the editors in New York. He was, in effect, honing his skills to fit the demands of the existing marketplace. In those days the best pulp magazines were helmed by strong-minded editors who had specific concepts of the types of stories that would compel readers across the country to buy their publications. These editors stamped their imprints into the content of their magazines, requiring within a genre fast-paced action stories, or violent stories, or suspenseful stories, or stories with a strong romantic angle. The result was that the most successful authors of the day slanted their material toward the known requirements of a particular market. As a maturing writer in his forties, Wayne had learned to write for the western magazines, but over the years he had gradually developed his own voice and his own techniques in the craft of storytelling. While his goal was still the same as it had been in the beginning, his talents emerged and he put more of himself into his stories. This fact is clearly demonstrated in “The Patriarch of Gunsight Flat,” first published in a 1950 issue of Blue Book. The narrative begins not with an action scene or with violence designed to capture the reader’s interest, but with a philosophical statement, one that is even more direct than the opening cited in “Book L’arnin’ and the Equalizer” published three years earlier. The growth and maturing of Wayne's’ literary talents made it possible for him to move on to a long and successful career as a novelist. (More than one hundred of his Western novels have been published; many of these have been made into feature-length films, and two—The Lawman, under the name Lee Leighton, and The Violent Land—received Spur Awards from the Western Writers of America as the best novels of 1953 and 1954, respectively.) Rather than being trapped—or worse, outmoded—by his background in the pulp magazines as so many writers of that day were, he was able to use the experience to develop his own skills. The magazines served as a rigorous apprenticeship for a young writer who learned much about the art of storytelling and about the discipline required to sit down at the typewriter every day, day after day, and write fiction. Money earned by his written word was always of great importance to Wayne. In the beginning nearly half a century ago the earnings from his typewriter supplemented a meager income from teaching. Later the extra money helped support a young family. Wayne always haunted the mailbox when a check was due. After he became a full-time writer he experienced great anguish if an expected check from the sale of a story was overdue. The pressure on him to produce was relentless, yet there was no other career that he wanted more in his life. And somehow the money always arrived in time to avert disaster. But even though money loomed so large in his thoughts and was such a frequent topic of discussion among his fellow writers, Wayne was philosophical by nature and a historian by training. He always believed that his work had a purpose beyond the obvious one of entertaining readers. His stories are distinguished from the run-of-the-mill pulp action yarns with wooden characters marching through familiar plots. He wrote for money, but in a greater, more profound sense, he wrote to explore hidden aspects of human nature and he attempted to cast a beam of light, no matter how small, in to the past. Throughout his career he believed that his ultimate success as a writer would not be measured by his earnings or his awards or his recognition among critics, but by his readers. A deep, private communion exists between writer and reader, and to Wayne D. Overholser that knowledge was always at the heart of his work.